Though the Lincoln Continental Mark II was not destined to last, its designers had big plans for it. Two of the ideas Ford toyed with were retractable and convertible versions of the Mark II. 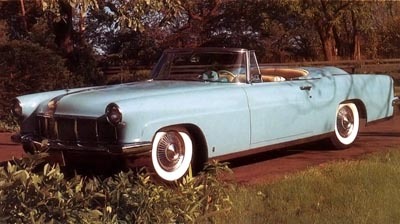 The proposed Lincoln Continental Mark II convertible. Gimmicky roof designs fascinated Dearborn designers in the 1950s, and Special Products was no exception. The fixed-roof pillarless coupe, sometimes called the "hardtop-convertible," had swept the market since GM pioneered the style back in 1949. What could be better for Ford's new super-luxury car than a hardtop that could actually transform itself into a convertible? There was even a precedent in the Chrysler Thunderbolt, a series of six show cars built in 1940-1941 by Briggs Manufacturing Company. Here the top was relatively small, just large enough to cover a three-passenger cockpit with single bench seat, so there was relatively little trouble storing it in the trunk. A schematic of the the proposed Lincoln Continental Mark II retractable. The retractable idea was first floated in Dearborn by stylist Gilbert Spear, whose mechanical drawings convinced Special Products head William Clay Ford to proceed with development for the forthcoming Lincoln Continental Mark II. A total of $2.19 million was allocated in 1953 and the task assigned to chief engineer Harley Copp. John R. Hollowell was the engineer in charge, however, and colleague Ben J. Smith did most of the actual design work. A "mule" was constructed from a 1952 Lincoln body and probably a 1952 Lincoln frame, but the trunk was elongated to house a steel top much longer than the Thunderbolt's. Nevertheless, the finished product worked like the proverbial charm. Though the retractable would have been the perfect gimmick for the pricey Mark II, management felt its development costs could never be recovered with the low production anticipated. Accordingly, the decision was made to offer only a fixed-roof hardtop, and the project was transferred to Ford Division in the summer of 1955. After another $18 million had been spent for testing, the "retrac" made a belated debut in the 1957 Ford line as the Skyliner. Intended for much higher volume than the Mark II, it was just as complex and, relatively speaking, just as costly. To no one's surprise, it garnered only marginal sales, and was dropped after 1959. The retractable idea resurfaced as part of the expanded Mark II line initially envisioned for 1958. Also considered were a more straightforward soft-top convertible, plus a hardtop sedan and "berline" limousine. But with minuscule sales, high per-unit losses, and a platform already rendered obsolete by long-range plans, the Mark II was doomed and so were these extensions. 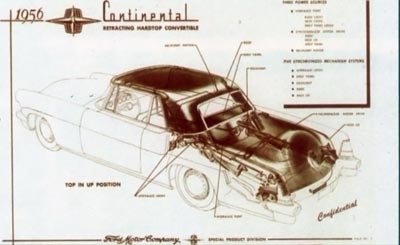 It was sometime during summer 1956 that Continental Division commissioned a prototype Mark II soft-top. Built by the famed Derham Coachworks of Rosemont, Pennsylvania, it was painted pearlescent white and sported red-and-white leather interior. Its top had very wide rear quarters, recalling the first-generation Continental cabriolet. Sources disagree on whether Ford seriously intended to offer copies, but sales would have been limited in any case: Retail price was estimated at an eye-popping $18,000. Like the retrac, there was simply no money to be made with a Mark II convertible -- or any of the proposed 1958 models. This Lincoln Continental Mark II convertible, built by Derham Coachworks, is the only of its kind. The prototype convertible was shown extensively, then given to Bill Ford for his wife's personal use. The Fords repainted it twice, then had it stripped and re-finished in sky blue. At the same time, the interior was changed to blue and white. The car was later turned over to a Ford executive. Another convertible was later cobbled up from a Mark II coupe by a private party in Florida, but the prototype car is the only one that can be considered "factory." The convertible and retractable were not meant to be. In fact, the Mark II was not long for this world, as the next page details.